The scene at Amanzimtoti’s Inyoni Rocks on Wednesday. Search efforts for the fourth missing teen were set to continue at first light. 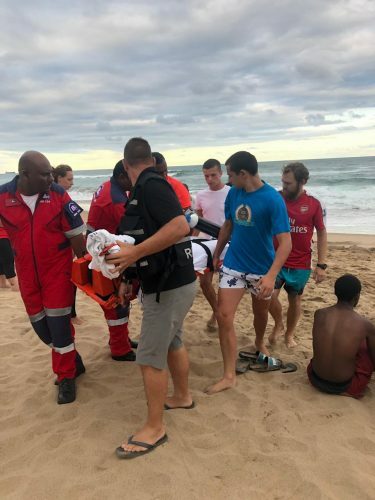 Emergency services descended on the beach at Amanzimtoti’s Inyoni Rocks on Wednesday afternoon, after four teens were involved in what is being described as a mass drowning, reports South Coast Sun. It is believed the four, who were all between 16 and 18 years old, entered the water just before 6pm, after lifeguards had finished their shift and closed the beach for swimming. They were swept out to sea by the current. 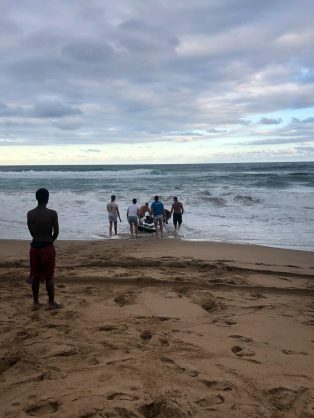 According to ward 97 councillor Andre Beetge, the swift efforts of off-duty lifeguards and members of the public who were training at the nearby Inyoni pool saw rescue attempts quickly initiated and the beach manager alerted. The SAPS search and rescue unit, fire services, and ER24 paramedics responded, along with VEMA paramedics. Three of the teens were returned to the shore, but the search for the fourth man was abandoned as darkness descended. The search will resume at first light on Thursday morning. It is understood the beach manager launched a jet ski during the search. Noticing something at backline, he dived to the bottom, blowing his eardrum in the process. However, it was not the missing man. The teens’ families were on the beach and accompanied them to Prince Mshiyeni Hospital.